Trader Joe's, a national grocery store chain, made its debut in Gainesville at 8 a.m. to a crowd that braved the rain to line up outside the Butler Plaza location. She speaks with WUFT-FM about her journey in Gainesville. The Student Senate meeting held on Tuesday night will discuss the use of blackface at a recent fraternity party. Vice presidential candidate Paul Ryan competed with hot weather and a heated crowd of his opponents’ supporters at a campaign event in Ocala today. The Republican congressman from Wisconsin answered North Central Florida residents’ questions in a town hall style campaign event. The event was held in the Ocala Downtown Square, where the temperature hovered around 87 degrees. The Republican Party has selected Chris Blair as a the nominee for Marion County sheriff. Blair will replace Dan Kuhn on the ballot in this November's election. The Alachua County School Board will vote in October whether to approve an application for a new year-round school. Attendees can also participate in workshops for resume writing and looking for jobs online. The fair will be held at the Martin Luther King Jr. Multipurpose Center on 14th Street. 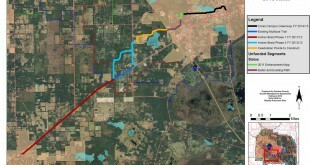 A vote on whether or not a bike trail should run through Haile Plantation ended in a tie at a Tuesday meeting of Alachua County Board of County Commissioners.